Years ago, when the world was smaller, NBA shooting guard Lazar Hayward was a center. Yeah, all 6-foot-6 of him. 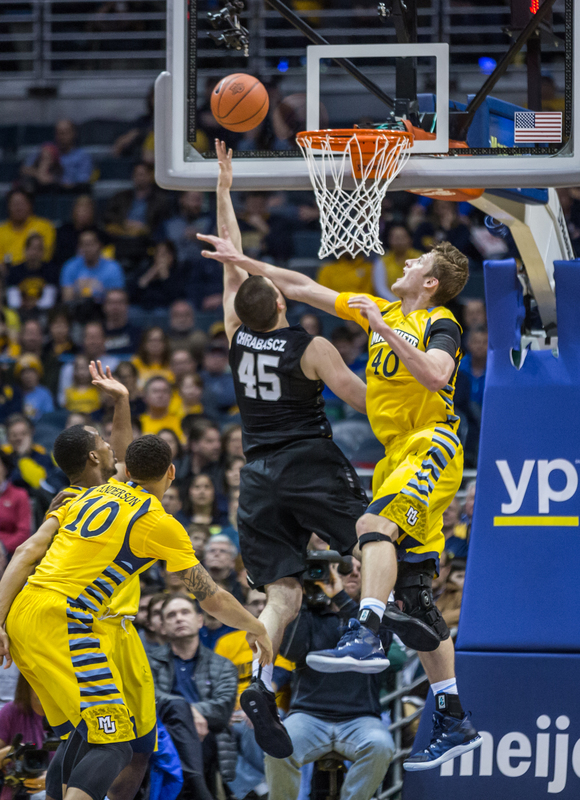 Those weren’t exactly the Dark Ages of Marquette basketball – the 2009-2010 team went 22-12 in a loaded Big East and was a 6 seed in the NCAA Tournament, after all – but they were, unquestionably, the diminutive ones. That year’s team followed the painful pattern of general smallness that plagued Marquette’s roster both in the years prior (think the Big Three, tripartite guard lineups of Dominic James, Jerel McNeal and Wes Matthews) and immediately afterwards, until Davante Gardner and the immortal Chris Otule finally gave the program a starting frontcourt that Gulliver couldn’t squash with his buckled leather boots. The ’09-’10 roster had exactly two players over 6-foot-8: the first was the 6-foot-10 Otule, a sophomore at the time who missed the season with a foot injury; the second, a 7-foot-2 freshman from Senegal named Youssoupha Mbao, who was the tallest player in the Big East but possessed the lowest basketball IQ. I remember, on one of the rare occasions he actually entered a game, he swooped in mightily for a rebound after the first of two free throws, then looked around puzzled as to why nobody else had moved. (Speaking of immortal, Mbao is still playing college basketball. He’s a redshirt senior at Marshall. Maybe he’s just a late bloomer). Given the extreme dearth of available size on that year’s team, former coach Buzz Williams had to improvise, sort of like when he has to change his shirt at halftime due to excessive man moisture. In what was quite literally the lowest point of any Marquette team I can remember, 6-foot-7 junior Jimmy Butler played the power forward sport, and in went Big ‘Zar at center. Baby, we’re not in Lilliputia anymore. Barring injury or sudden interference from Wayne Szalinski, the Golden Eagles will open the 2015-2016 with 6-foot-10 freshman Henry Ellenson and 6-foot-11 junior Luke Fischer as their starting front court. And that, for lack of a better word, is big. Considering the size and talent of both players, it’s not a stretch to say that this could be Marquette’s best starting front court in decades. But just how good will the Ellenson/Fischer combo be? And, more importantly, how will it stack up with the best of the Big East? The short answer: He’s really good. The No. 5 recruit in the nation according to ESPN, Ellenson was billed as a face-up four with the size to be a dominant inside force and the skills and mobility of a much smaller human. So far, he’s been as good as advertised – if not better. In four exhibition games in Italy (not exactly the most impressive qualifier, but still) Ellenson led the Golden Eagles in scoring at 21.3 points per game (on 56% shooting) while chipping in 7.5 rebounds. He even made four 3-pointers. Yeah, the kid can play. I find myself compelled to delve into a deeper analysis of Ellenson’s unique skillset (big, quick, smooth, et al.) because he’s such a mesmerizing talent, but I’ll resist because I wouldn’t exactly be covering new ground. 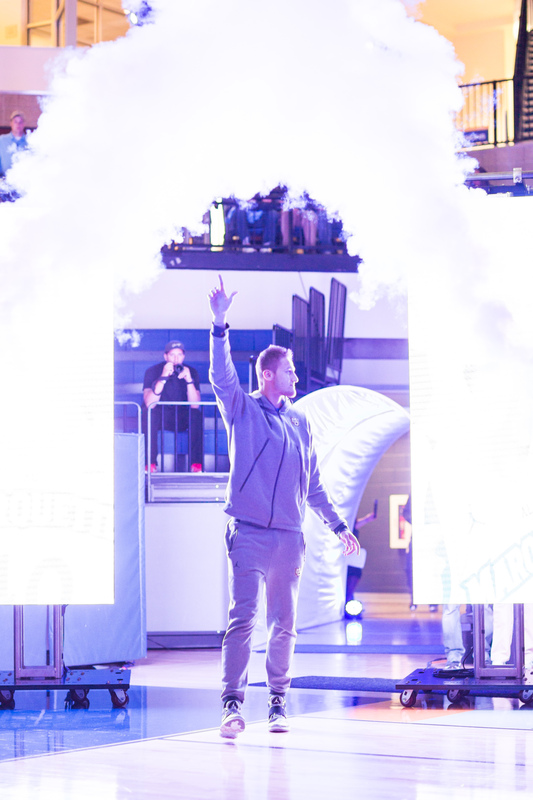 For further information on Ellenson, check out this article by Bleacher Report’s Jonathan Wasserman or this one by our very own Andrei Greska. Instead, I’ll simply say this: I believe. There’s so much incessant hype and hoopla swirling around in today’s writhing mass of media coverage that I find myself perpetually tempering expectations. After four games (against overmatched Europeans, no less), I’m trying to remain reserved on Ellenson. That being said, deep down, I think he’s going to be one of the best players in the country this year. Period. In seven months, if that comment looks stupid, I’m blaming the grainy video stream from Europe. Through his first seven games in a Marquette uniform, Big Fishy lived up to his Twitter handle – he was indeed a very large perciform in a teeny, tiny pond. The Indiana transfer by way of Germantown, WI, was averaging 13 points per game on 81% shooting, stomping through thunderstruck teams like Alabama A&M and Morgan State like a god awful T-Rex. He ripped through defenses the way Bruce Banner goes through purple pants. He was unstoppable. And then conference play started, the full moon gave way to dawn, and Fischer turned back into a moral man. Obviously, he was never going to keep up his extraordinarily efficient pace from those first few games, and he finished the season with averages of 11 points and 4.8 rebounds per game on 60% shooting. Still, those were pretty great numbers for someone who had only played 130 total minutes until midway through his sophomore year. The problem for Fischer’s late season struggles wasn’t a lack of talent. Uncommonly agile for a true back-to-the-basket center, Fischer was ranked No. 34 overall by ESPN in the 2013 high school class and displayed the kind of skill and soft touch around the hoop rarely found from big men in the college ranks. He was, however, a mighty victim of circumstance. Consider this: The Golden Eagles only managed to shoot 43.7% from the field last season, good for (not sure if that’s even the right term) 166th in the country. As far as perimeter scoring threats go, the team really only had one: fifth year senior Matt Carlino, who shot 41.9% and made well over 1/3 of the team’s total three pointers (83 of 207). It was an ugly mess of broken jumpers and wayward shots, and unfortunately for Fischer all those bricks fell squarely on his head. After his torrid start against subpar opposition, team’s adjusted accordingly. They doubled him in the paint, forcing the ball out of his hands and daring anyone else to make a shot. Fischer, to his credit, still managed to piece together solid games, but his upside was limited by the talent around him. Oh, and by the way, he was basically playing with one shoulder. So how will he fare this season? Well, I’m not exactly sure if Marquette will shoot any sharper from distance. With Carlino gone, redshirt sophomore point guard Duane Wilson will be the team’s main perimeter scorer, and while he was decent from three last year (35.5%) he’s more of a slasher than a sharpshooter. The best shooter on the team might be sophomore Sandy Cohen (33.3%), but he’ll have to shoot with much more confidence (and regularity) if he’s going to replace some of what Carlino left behind. The biggest wild card is junior Jajuan Johnson, who has been a resounding flop two years into his career. A top-35 player in the 2013 class himself, Johnson made only 16 of 73 three point attempts last season for a dreary 21.9%. But Johnson has a pretty fluid stroke and figures to play a fair amount of minutes, so if this team is going to truly space the floor for Fischer, Johnson to improve on those numbers markedly. 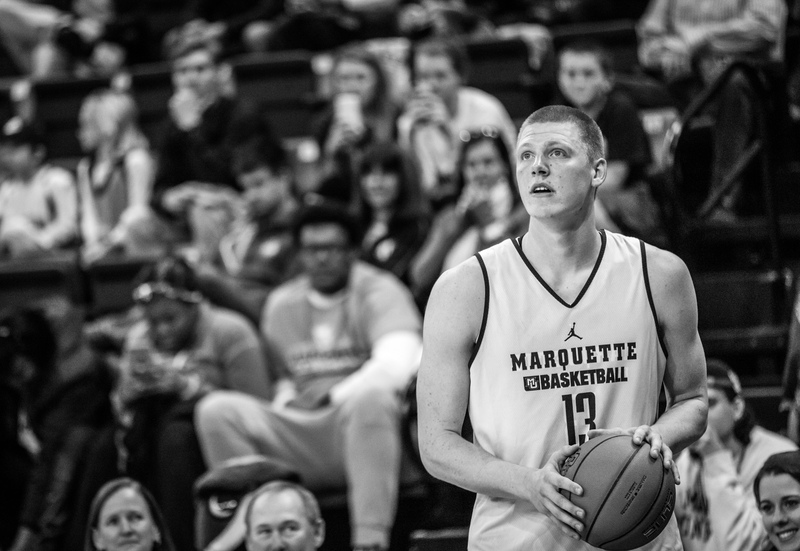 Of course, the biggest reason to like Fischer’s chances at a big year is none other than Ellenson himself. Most teams won’t be able to afford doubling Fischer in the post with Ellenson patrolling the other side of the lane. Ellenson’s versatility and ability to knock down jumpers will at least pull opposing big men out of the lane and allow Fischer to go to work in more isolated scenarios. And if Ellenson can truly be a perimeter threat and drain threes with a high level of consistency, leaving Fischer to man the middle all by his lonesome? Forget about it. The new Big East has proven to be much smaller than its monstrous spiritual predecessor, both metaphorically and literally. Long gone are the days of Connecticut, Syracuse, Pittsburgh and Louisville bolstering the conference’s lineup, and with them the blue chip post players that so often used to man the lane. Go ahead and look up and down the rosters for the conference’s top squads. Players like Andre Drummond, Hasheem Thabeet, Samardo Samuels and Rakeem Christmas are but ghosts of the past. Take, for example, Xavier, a tourney team that went 23-14 last year. They don’t have even one player on their roster designated as a center. Butler, a team that finished second in the Big East least season (23-11) and is ranked No. 22 in the AP preseason poll, is similarly size deficient. The Bulldogs’ only player over 6-8 is 6-foot-10 freshman Nate Fowler, who was a three star recruit out of Ohio. Beyond him is 6-8 sophomore forward Tyler Wideman, but he played only 10 minutes a game last year and averaged barely over 2 ppg. Neither will be much of a presence. In fact, the Bulldogs main interior threat is actually versatile senior star Roosevelt Jones, who has a solid back-to-the-basket game and the strength to muscle up smaller forwards. But at 6-4, 225, he’ll have to chop a lot of wood in matchups with either Ellenson or Fischer. The team with the most size, actually, is St. John’s. The Red Storm feature four players over 6-9 – including 7-1, 322-pound redshirt freshman Adonis De La Rosa – but all of them figure to be major projects for a team universally considered the worst in the conference. In terms of the Big East’s elite, that really leaves only reigning conference champ Villanova, who is the only other Big East team that earned a preseason Top-25 ranking (No. 9). As it turns out, they also have the conference’s best returning big man: 6-11, 245 pound Daniel Ochefu. Ochefu is not a ballerina. But he’s big and he’s strong and he won’t easily be moved. He doesn’t possess many deft post moves, but he knows how to seal his man and when he gets the ball in deep enough it’s game over. He had a game last season in which he went 7-7 from the field. Five of the baskets were dunks. Still, his averages as a junior were fairly modest at 9.2 ppg and 8.5 rpg, and the Wildcats don’t really have any reinforcements to help him in the trenches. But really, none of this should come as a shock. The current landscape of college basketball is dominated by guards, and the Big East is no different. The best players are all wings: Kris Dunn, D’Vauntes Smith-Rivera, Kellen Dunham, etc. And with that fact comes another one: Marquette could not only have the conference’s best frontcourt, it’s possible it could be by a wide margin. No other team has near the size or the talent that Ellenson and Fischer possess. Somewhere out there in the empty depths of free agency is Lazar Hayward, the world’s smallest former center. And he has a big smile on his face.